News emerges from BNP Paribas that the most dynamic occupiers in Western European property markets belong to the technology, media and telecoms (TMT) sector and that the most important market in the region is London. This comes as no surprise given the plans of Google to move to its new home in King’s Cross and the focus on developments in Tech City. But the same hothousing of TMT businesses is also evident in the area Prime Minister David Cameron has referred to as Silicon Alley, a cluster of businesses running alongside the M4 originally clustered between Reading and Swindon but now extending as far as Bristol. Companies that have found a home in the area include the likes of Cisco, Microsoft, Oracle, Ericsson, Vodafone, O2, Citrix, Dell, Huawei, Lexmark, LG, Novell, Nvidia, Panasonic, SAP and Symantec not to mention the countless other smaller businesses, consultants and freelancers that share this hothouse. 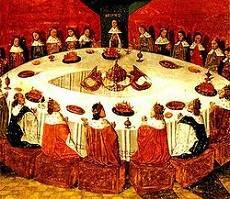 The Knights of the Round Table may be the stuff of legend but it seems King Arthur was on to something, for a new study reveals that people sitting in a circular formation at round meeting tables are more likely to want to ‘belong’ to a group and are less prone to be antagonistic. By contrast, the research from the University of British Columbia’s Sauder School of Business found that people seated in an angular arrangement – i.e. “The Boardroom” in Sir Alan Sugar’s The Apprentice – are more likely to look out for number one. “The geometric shape of a seating arrangement can act as a subtle environmental cue for people, by priming their fundamental need for inclusiveness or individuality,” says Sauder Assistant Professor Juliet Zhu, who co-authored the forthcoming study to be published in the Journal of Consumer Research. Allowing staff to make design decisions in a workspace enhanced with office plants can increase wellbeing and wellness by as much as 47 per cent, increase creativity by 45 per cent and increase productivity by 38 per cent, new research has revealed. 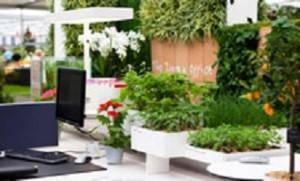 Visitors at this year’s Chelsea Flower Show were challenged to take part in the study which measured their creativity, happiness and productivity as they experienced a range of different workspace designs. The findings, which would be expected to translate to a significant increase in business profitability, confront the popular belief that plants and art are an unnecessary or even wasteful element of the business environment. Results from this and related scientific investigations indicate that across all measures of psychological comfort and business performance, the managerially popular flexible, controlled, lean office, is consistently inferior to a space enriched by the design decisions of people who work there. Deskheads of a certain vintage may have viewed the news that Zaha Hadid had bought the Design Museum’s London home for £10 million in a somewhat different light to much of the media that reported the sale. While journalists succumbed to the apparently irresistible pull of architectural headline magnet Zaha, to some of us the interesting part of the story was that the sale finally freed the Design Museum to move to the long empty Commonwealth Institute building in Kensington. The building is one of the most architecturally important modern buildings in London and has a long association not only with The Commonwealth Institute educational charity but as a venue for cultural events and exhibitions of design, not least the now defunct Prima and Spectrum exhibitions which did so much to promote commercial interior design in the UK. Two UK-based office buildings, Botanic House in Cambridge designed by Formation Architects and One Eagle Place by Eric Parry Architects have been shortlisted in the “completed office” category of the World Architecture Festival awards, the world’s largest architectural festival and awards competition dedicated to celebrating and sharing architectural excellence from across the globe. The Botanic House scheme, which was completed in June 2012 is contained in a seven storey “lens shaped” building which provides a generous office rental space of 600 m2 (6,460 sqft) floorplates per floor, while One Eagle Place renews an urban block in the heart of Piccadilly. A video of the Botanic House project can be seen on the Formation Architects website and you can read the complete WAF shortlist here. Video: is this the world’s most sustainable office building? What is claimed to be the world’s most sustainable office building has just achieved a platinum LEED certification. The NuOffice building in Munich was supported by the EU funded Direction project which promotes energy efficient and sustainable building design along with the Fraunhofer Institute for Building Physics (IBP). The focus of the building’s design is on energy efficiency and applies radiant heating and cooling technology, switchable glazing and innovative insulating material to reduce the environmental footprint and running costs of the building. The developers claim that local energy costs have increased by 50 percent over the last decade so the new building which is expected to reduce energy consumption by 90 percent can offer a substantial cost saving over conventional designs. Detailed plans have been submitted for the design of the new Google London headquarters building in King’s Cross. The 1 million sq. ft scheme designed by architects Allford Hall Monaghan Morris does not exceed 11 storeys at any point and will be home to up to 4,500 employees, double the company’s current London workforce and potentially making it the largest Google operation outside of New York. The scheme is part of a wider development of Kings Cross and will incorporate 750,000 sq. ft. of office space with 50,000 sq. ft. of shops and cafes. Current employees will relocate from three existing buildings in the capital. Subject to approval for the detailed design from Camden Council, who have already granted planning permission, work will begin on the site next year with completion set for 2016-2017. Architecture firm Gensler has released the results of its 2013 US Workplace Survey. The report claims that under a quarter (24 percent) of US workers work in an optimised working environment with the remainder suffering from unnecessary lost productivity and a lack of innovation and engagement. The survey of more than 2,000 knowledge workers from across the US examined specific design factors across four work modes defined by Gensler: focus, collaboration, learning and socialising. The report concludes that the modern workplace has a number of new and increasingly important drivers including new technology, globalisation, generation Y and so on which define where, when and how workers perform their jobs and concludes that the ability to balance focus and collaboration with strategic workplace design is essential. There is a general consensus around the workplace cognoscenti that design can and does impact upon the productivity and effectiveness of people in the workplace. 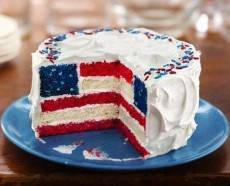 That’s reflected in research, data and anecdotal exchanges, online and at events. What’s not often done is in linking this data to HR results, from employee surveys. While driven by professionally conscientious HR teams, their goal is shaped by the ever present desire to improve performance and hence save cash and enhance margins. In other words it’s a management initiative. But half the time it’s management who are the problem.